The Oak Hill Fire Department used to cover the area from Brodie Lane to Barton Creek and from Sunset Valley to Dripping Springs. As the city of Austin grew over the years, Austin Fire Department took responsibility for much of the eastern end of that district. The formation of Travis County ESD#3 in 1992 required that the Oak Hill Fire Department serve only Travis County locations, except when requested elsewhere as part of automatic aid, mutual aid, or through a contract for services. The Oak Hill Fire Department has gone through two district name changes since it was founded in April 1968. 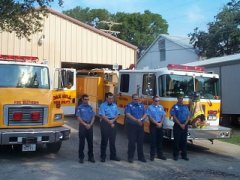 On August 13, 1985, Oak Hill Volunteer Fire Department became Travis County Rural Fire Protection District #6. Later, on October 1st of 1992, the Oak Hill Fire Department became the current Travis County Emergency Services District #3. The department was founded when Loy Mackey first moved to Oak Hill and was comforted by the fire hydrant located across the street from his house – until he discovered there was no fire department to use it. In September 1967, Mackey, along with Kermit Burrer and Bill Jackson, decided they needed to establish a fire department and started knocking on doors for donations. Read more. 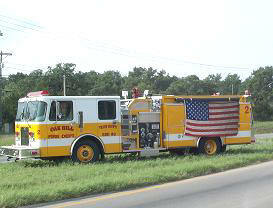 The Oak Hill Fire Department spent 20 years using yellow apparatus at scenes. Here is the story behind the yellow trucks, which have been replaced with the more traditional red fire trucks. The weekend after the attacks on September 11th, Oak Hill members were out at the “Y” in Oak Hill collecting money for the families of firefighters and EMS personnel who died as a result of the attacks. Everyone was so generous, and as a result, the department collected over $35,000! The flag on Engine 2, shown above, was flown during the Vietnam War.